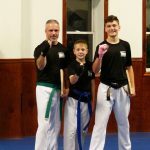 The karate taught at Haymore’s United Karate is a blend of traditional Okinawan and Korean techniques. This makes the United system a unique system of intricate hand movements and powerful kicking movements. 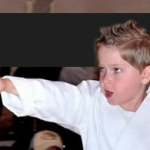 The goal of all traditional karate passed down from the old Masters was for physical and mental discipline and self defense; “to overcome oneself not your fellow man.” This is the same approach Haymore’s United Karate uses in their classes. True kickboxing was developed by karate masters in the early 70′s. These masters (one of them the founder of United Karate and master of Jim Haymore) combined boxing and their karate systems, thus putting together one of the first mixed martial art systems in America. Jim Haymore continues to teach this effective form of TRUE kickboxing that was passed down to him by Mr. Ben Kiker. The result is a well rounded student. 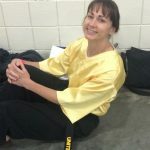 The Jiu Jitsu taught at Haymore’s United Karate is a blended system that has evolved from various forms of grappling arts that Jim Haymore has studied over the past 30+ years. This self defense system is masterfully woven into UNITED KARATE/KICKBOXING and is taught in designated segments of various class settings.